As this is being written, the news is about an Israeli effort to interdict a “humanitarian” flotilla of ships that refused to dock at its port of Ashdod to have its passengers and cargo checked. When Israeli troops boarded a Turkish ship in international waters on Sunday they were met with violent resistance that led to casualties. The Israeli navy stopped six ships ferrying 700 people and 10,000 tons of supplies toward the Hamas-run Palestinian enclave. I don’t know what the flotilla was delivering, but it is likely that among its passengers were Hamas terrorists and that there are weapons hidden among its cargo. That is why they refused orders to proceed to the Israeli port where tons of cargo routinely docks before making its way to Gaza. The flotilla was a deliberate provocation. Naturally, much of the world will blame Israel. Having been in a state of war since its founding, Israel routinely has interdicted shipments of weapons to the PLO and Hamas. One of the most notable was in January 2002 when the Karine-A, a Palestinian ship, was found to have more than fifty tons of Iranian weapons and explosives. Largely unreported are the fierce battles Egyptian Special Forces are waging in central Sinai with Bedouin tribesman smuggling weapons and fighters into Gaza on behalf of al Qaeda. As always, the Middle East is an asylum for the insane who, when not trying to kill Israelis, stay busy killing one another. I believe that war will come again soon and will originate in Lebanon. 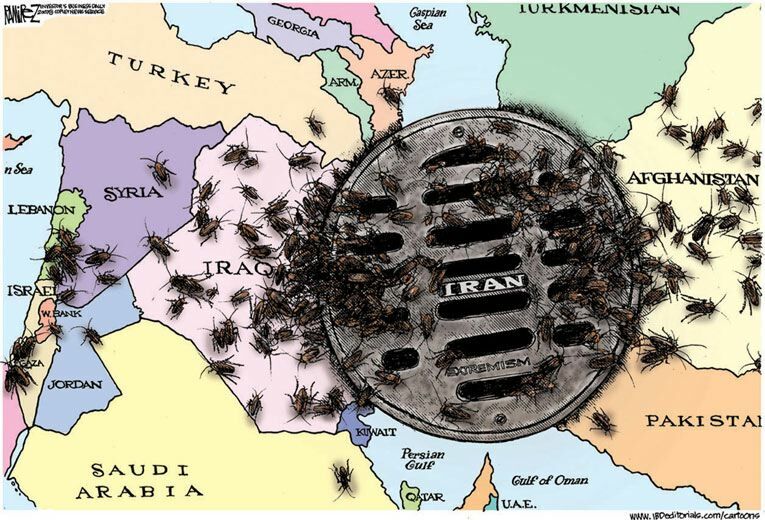 In the end, the decision will be Iran’s, not Syria’s, its sock puppet and stalking horse. Syria has reportedly provided the Lebanon-based Hezbollah an estimated 1,000 Iranian-made rockets and missiles, all aimed at Israel. The last time the Israelis had to deal with Hezbollah aggression from Lebanon was in 2006. The conflict lasted 34 days. 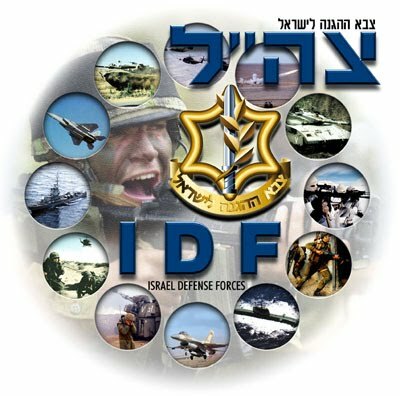 It is widely agreed that the Israeli Defense Force performed poorly and, not surprisingly, the most criticism came from the Israelis themselves. Part of the problem at the time was an indecisive Prime Minister, Ehud Olmert, who has since been replaced by Benyamin Netanyahu. If “Bibi” gets any intelligence regarding a pending attack, he will not wait around for it to start. On word of the confrontation with the flotilla, he cancelled a June 1 meeting with President Obama and returned to Israel. You may recall that in March Barack Obama accorded Netanyahu one of the nastiest receptions ever given an Israeli Prime Minister. Only the Dalai Lama fared worse, being ushered out the White House back door. One might reasonably assume that the president is no fan of Jews after having spent twenty years in the Chicago pews of the Trinity United Church of Christ listening to the Rev. Jeremiah Wright say hateful things about them and about America. Obama has many close ties with black nationalists and anti-Semites such as Nation of Islam’s Louis Farrakhan. One of his longtime associates is Palestinian apologist Rashid Khalidi, a Columbia University professor. There is ample reason to believe another attack on Israel is likely. The Syrians have reportedly moved the number of their army units to the Israeli border and have been supplying arms to Hezbollah ever since the last war. Iran’s Mahmoud Ahmadinejad has been saying ever more crazy things of late. He even lectured the United Nations on the coming of the Twelfth Imam, a Shiite spook whose return will require massive worldwide death and destruction. More recently Mahmoud got into a fight with the Russians over the proposed UN sanctions. Iran is running out of friends even if its oil is not. 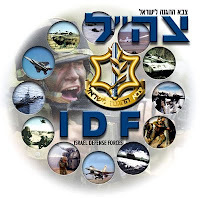 The Israelis have been practicing war games that include long distance flights, the purpose of which may have something to do with dropping some very big bombs on places with Persian names. While all this is going on, the United States is significantly building up its fighting strength in the Mediterranean and the Persian Gulf regions. Carrier Strike Group 10, led by the USS Harry S. Truman, pulled up anchor on May 21st and headed to the Middle East. That will put two carrier groups in the area. More vessels, including guided-missile cruisers and destroyers will be there as well. No matter how it plays out, the Middle East is going to turn into a shooting gallery again. The Iranians, Syrians, and Palestinians in Hezbollah and Hamas are living testimony to why all those people demanding that Israel make peace with them are clueless or worse. I have a few enduring Memorial Day memories. Most involve my Dad who never served in the military, being too young for the First World War and too old for the Second twenty years later. Even so, there was never a Memorial Day in Maplewood, NJ when we did not go down to the park, also named Memorial, and watch the veterans, the police and fire units, the Boy and Girl Scouts, and the high school band march to the grassy area where town officials would give speeches about the fallen heroes. Little Maplewood had its share that had served in all of the nation’s wars. Even as a child I understood my Father’s pride in his nation and in those who had fought to protect its liberty. Later, when I was in the military my other memory was marching through downtown Columbus, Georgia during the Memorial Day parades. It is a different kind of holiday from Fourth of July. It’s about remembrance. It is focused on those whom Lincoln said gave their last full measure of devotion to their nation. It is a sober holiday, but it is also a day for picnics and barbecues. 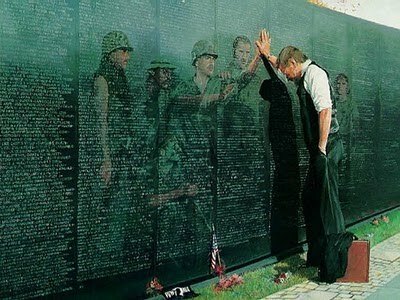 In a way, those who died are honored by the mundane activities in which we engage on a day dedicated to their memory. They would have done the same had they lived. What strikes me most is the way, then and now, so many young men enlisted to fight our wars. Others accepted conscription and fought bravely too. What is so very different is today’s all-volunteer military. Nobody has to sign up for duty, but they do. The demarcation line came in the 1970s when Americans, seeing the carnage of war in Vietnam on their nightly television news, watching the casualty numbers grow, gradually came together to protest year after year until the conflict ended. While we have great pride in our military, regarding it more highly than other element of our government, Americans have become detached from the bloodletting of war. They are fought at great distances. Mostly, Americans are highly resistant to any losses in battle despite the records in past wars of literally thousands of casualties. Those were wars we needed to win. The news lately was of the one thousandth casualty in Afghanistan. We have been there since shortly after 9/11. 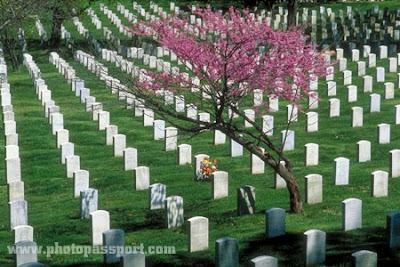 We lose 40,000 people to death on our highways every year; more by far than the totals of those we have lost in Afghanistan and Iraq. It doesn’t make it any less painful for their families, but in the long battle for freedom, it is a remarkably small price to pay and the extraordinary part is that there are still heroes willing to pay the price. Ever since polls have been taken there have been presidents who encountered disapproval during their terms in office. Usually history exonerates them to some degree. This is not likely to happen with Barack Obama. As this is written, a Politico.com poll puts Obama’s job disapproval rating at 46.4% and Congress has a disapproval rate of 72%, a figure matched by Rasmussen Reports. Obama’s disapproval rate according to Rasmussen was 44%. Polls, we are always told, are “snapshots” of public opinion at a given time, but the polls consistently tell us that the vast majority of Americans disapprove of the President and Congress, and believe the nation is headed in the wrong direction. Suffice it to say that, if elections were being held next Tuesday, voters would replace most of those in Congress and, if Obama’s ratings continue to fall—-and I think they will—-there would be an angry mob surrounding the White House carrying torches and pitchforks demanding his resignation. In that fanciful scenario Obama would head home to Chicago to work on another ghost-written autobiography or memoir of his brief stay in the White House and America would be stuck with Joe Biden. If Nancy Pelosi is reelected, she would be next in line! 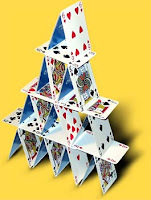 Since January 2009 the Obama administration has created an economic and financial house of cards. No part of it is sustainable. 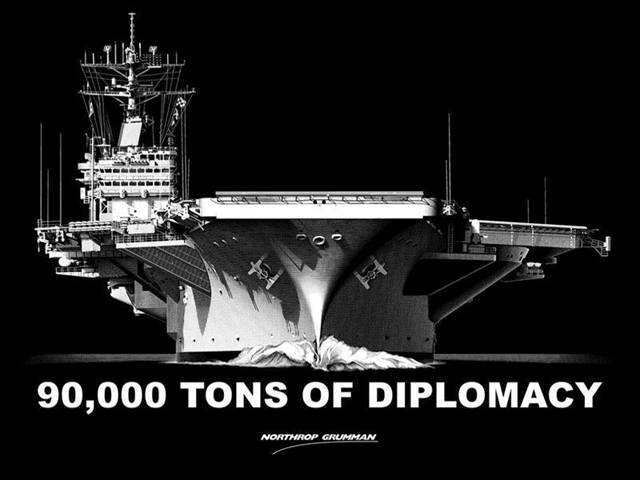 Turning around Congress and the nation’s future can be likened to turning a super tanker. It takes five miles of ocean just to slow the ship. In America’s case, the ship has been outward bound on a sea of progressive programs that everyone knows are not working and which have begun to spring giant leaks in the hull. There is plenty of blame to go around for our present troubles. Both parties studiously ignored the ticking time bomb of Fannie Mae and Freddie Mac that have put taxpayers on the hook for $1.6 trillion. The “toxic assets” they created brought down banks and investment houses. The people in charge of maintaining the value of the U.S. dollar, primarily Alan Greenspan of the Federal Reserve, began to reduce the amount of interest banks had to pay to borrow. By the time that amount reached zero percent and banks became reluctant to loan even among each other, one might conclude our money had become valueless. When the market crashed in September 2008, the U.S. government bailed out some banks and investment firms, buying their “toxic assets.” Banks stopped lending, Lehman Brothers went out of business, and the slide toward economic collapse began in earnest. With all that TARP money and subsequent “stimulus” billions, the one element of the economy that didn’t get any help were our small and medium size businesses, the ones that create eight out of every ten new jobs. Meanwhile Social Security is broke and Medicare soon will be. The former is insolvent and the latter has been expanded in ways that will require rationing medical care European-style. There may not be “death panels”, but the effect will be the same. There will be little incentive for anyone to go into the medical profession. Thanks to the Obama administration’s close association with SIEU, the mammoth government service workers union, Americans are discovering that it and other comparable unions have been operating on a “public be damned” philosophy. 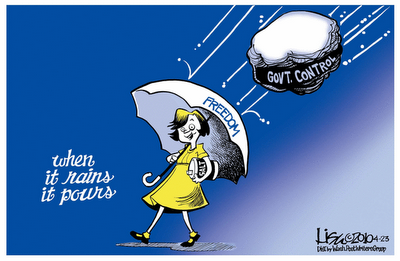 In America, the biggest employer is state and federal governments. Union members are no longer affordable. When a teacher recently complained she wasn’t being paid enough, New Jersey's Governor, Chris Christie, told her to get another job. Around the 1970s the American economy began to move away from one that actually made things to one in which “financial services” replaced this essential requirement for a viable economy. Moody’s Investor Services keeps repeating that our “Aaa” rating is going to go bye-bye any day now. It will cost more for the U.S. to borrow money and we are already paying billions in interest on what has been borrowed. If this sounds like Greece, it is. One reason Congress is so unpopular is that they are repeating and exacerbating all the failed policies of the Depression years; not getting out of the way so that the private sector of the economy can recover. More and more of the economy is being nationalized. There are two outstanding reasons President Obama is unpopular. He lies all the time and he is spectacularly incompetent. He is the living example of the Peter Principle in which a person is finally promoted to a job for which he has no qualifications. I suspect there were always gay soldiers in any army throughout history. I also suspect most of them kept their “sexual orientation” to themselves. Armies are composed primarily of men and they still do the real fighting. One can reach back to World War Two to recall women’s units that served our nation well. In Israel, women are an integral part of its defense forces because it has always been a tiny nation under siege and must perforce include them. On Thursday, the Senate Armed Services Committee voted 16-12 to approve an amendment to the Defense authorization bill that would repeal “don’t ask, don’t tell”, a policy initiated by the Clinton administration as a sop to its liberal base. It was not the most auspicious start to his two terms. An amendment by Rep. Patrick Murphy (D-PA) passed the House on a 234-194 vote. It would repeal the policy that prohibits homosexuals from serving in the military. More damage has been done to America in the name of “social justice” than can be enumerated here. I served in the U.S. Army in the early 1960s, most of the time at Fort Benning, Georgia. There were one or two gays in my unit. I assume some of the men with whom I served knew it and none to my knowledge expressed any concern because it did not personally affect them. One would think, based on this, I would favor gays in the military. I don’t. I have never met an officer who thought it was a good idea. A lot of them think mixing young men and women with raging hormones is a bad idea. I do not have the statistics on how many of the women get pregnant on duty, but I suspect it may well equal the number of gays sent home. What we are witnessing is one more example of how the mentality spawned in the 1960s regarding social and sexual issues has reached its culmination. Those were the years when women’s rights and gay rights began in earnest and, of course, when the civil rights movement gripped the nation. These movements transformed the nation is much the same way President Obama entered office promising “transformation.” Change is not always a good thing, but no one would argue that, a century after the end of the Civil War, the nation had to finally grant full equality to Afro-Americans. The other two movements, however, have proven problematic. To begin with, women are different from men. And gays and lesbians are different from heterosexual men and women. Women entered the work force in great numbers, often putting off marriage and babies. The divorce rated doubled. When they had babies, they often turned them over to nannies or daycare services. A lot of children have grown up without fulltime nurturing, taking their cues about life from television, movies, teachers, and their clueless contemporaries. That half constitutes the nation’s liberals. The other half grew up in traditional families with traditional values. They are politically conservative and many have joined the Tea Party movement. Gays (I will use the term to include lesbians) grow up with a whole set of problems heterosexuals rarely glimpse. They are, by definition, different from the majority of the population and this is cause for a great deal of emotional anguish. The gay movement has primarily been on a quest for self-esteem and, secondarily, an end to the legal hurdles they encounter. The push for gay marriage is wrong on many levels for a society, but there is little harm in removing some of the legal obstacles they face when they choose a life partner. Even gays mimic heterosexuals when they divorce. Letting gays serve in the military, however, is an extraordinarily bad idea. There are distinctly male values that have real value for society. Those values are integral to military service where large groups of men serve in close quarters. Add gays and women into the mix and it creates problems for everyone. Women are still prohibited from serving in combat. You have to be there to understand this. The fact that we have a volunteer military has deprived a large segment of our population, a younger generation, from the experience, the duty, and the honor of serving their nation under arms. Most professional military, however, believe we have a superior military because of it. 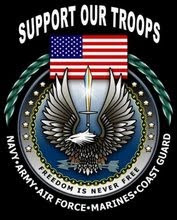 We have a very "politically correct" military with all the problems attendant to that. Those who volunteer to serve in our military are owed a debt of gratitude. However, expecting men and women to serve with gays undermines a core element of a successful military, the morale and esprit de corps vital to a fighting unit. Removing “don’t ask, don’t tell” is just one more way to reduce the effectiveness of our serving military. It is a distinctly liberal idea, a notion of “equality” that does not reflect reality. 5/27/10 - The President, after a lapse of 309 days, held a news conference Thursday. It came shortly after news that earlier in the day the director of the Mineral Management Service, Elizabeth Birnbaum, had either resigned or been fired. Obama professed to not know the circumstances. Yeah. Sure. What we do know is that Obama’s method of dealing with a news conference is to talk each question to death. In addition, he makes sure that we all know that, no matter what the problem under discussion, it was all George W. Bush’s fault. Watching Obama’s head swivel back and forth between the TelePromters as he read his opening prepared statement for the first fifteen minutes or so was mildly comical and it occurred to me that he has become a real life parody of a Saturday Night Live parody, the latter of which is at least entertaining. The president then used one of his snore-inducing answers to segue to the usual blather about a “clean energy” economy. This is pure fiction. America and the rest of the advanced nations of the world depend entirely on oil, natural gas, and coal. Long after all of us and our grandchildren are dead these hydrocarbons will still be used. And of course the President took the opportunity to push the legislation before the Senate that would put the federal government in charge of who gets energy, how much they get, and how much they will pay for it. Using the bogus claim that carbon dioxide is a threat to human life the EPA is currently trying to gain control all energy use. Cap-and-Trade, a huge tax, would destroy what little hope is left for the economy to recover. The highlight of the conference for me was when the insane old crone, Helen Thomas, asked about Afghanistan after Obama had seemingly exhausted the subject (and the audience) on the topic of the Deepwater Horizon oil rig disaster. Later questions dealt with the Arizona law and the White House criticism of it and border security. 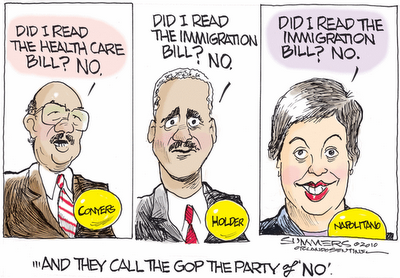 Obama used them to push amnesty for illegal aliens without actually saying amnesty. Meanwhile, more and more states are fashioning their own version of the Arizona bill in lieu of the federal government’s failure to stop illegal aliens. 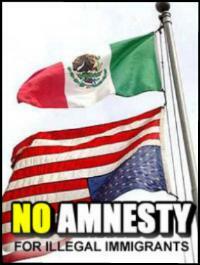 Amnesty is a strictly Democrat “answer” to the problem. Responding to a question about the oil spill, the President earlier had said, “I intend to use the full force of the government to protect our fellow citizens” on the southern state borders affected by the spill. One could only wish that he had the same resolve regarding the thousands of illegal Mexicans and “others” that continue to pour across. The issue of a possible White House bribe to a candidate to drop out of the Pennsylvania primary race got danced away with the usual assurances from what we were told was going to be the most transparent White House ever. I feared for my sanity after an hour and stopped watching and listening. Unlike previous presidents, Barack Obama will NOT be here on Memorial Day. So wrote George Allen and Marlo Lewis in a recent Forbes commentary. Allen is a former U.S. Senator and Governor from Virginia. Lewis is a senior fellow in environmental policy at the Competitive Enterprise Institute. The Senate is scheduled to vote June 10 on the Murkowski Resolution, S.J. Res. 26. If passed it will stop the out-of-control Environmental Protection Agency’s global warming rampage. The resolution has 41 sponsors, but needs 51 votes to pass. There will be no filibusters and no second change to reverse the worst attack on the U.S. economy and the freedom of Americans to utilize energy for business and personal use. Americans have witnessed the spending of billions in stimulus bills that have not reversed or slowed the worst unemployment rate since the Great Depression. They have witnessed the take-over of General Motors by the federal government. They have watched this Democrat-controlled Congress ram through a healthcare “reform” bill that takes over one-sixth of the nation’s economy and a Cap-and-Trade Act, renamed a “climate” bill, is waiting for a vote. When the Environmental Protection Agency was established in 1970 no one ever imagined that it would exceed its mandate to ensure clean air and water to such an extent that it would pose a threat to the lives of Americans and to the economy. It is in control of two people who are virulent environmentalists. Carol Browner, an Obama “czar” whose appointment was not subject to congressional oversight was an EPA administrator during the Clinton administration. She is an avowed socialist and close associate of former Vice President Al Gore. Lisa Jackson, the current administrator, worked with her before being selected to head the New Jersey Department of Environmental Protection. The same day Rasmussen Reports revealed that Barack Obama has the lowest approval rating of any previous President it was reported that Ms. Jackson had cancelled attendance at a political fundraiser in New York next week. If that is an EPA priority it has pursued this goal in some strange ways. For example, it has consistently banned some of the best pesticides ever invented to protect against termite infestations that do billions in damage every year or DDT that actually won a Nobel Prize for its protection of human life against the scourge of malaria and other mosquito-borne diseases. The EPA is so anti-chemical it is currently looking for a way to stop the use of oil dispersant chemicals to reduce the threat to marshes and other areas the spill may reach! While this is happening, it is seeking to impose rules that would put an end to mountaintop coal mining, closing off access to an energy resource responsible for 50%of all the electricity used daily and putting an end to countless mining industry jobs. The nation is now at a crossroads between a future in which the federal government, through the EPA, controls the entire economy or whether this evil genie gets put back in the bottle. We live in an America in which the amount of water we can use to flush our toilets has been regulated and we will soon be unable to purchase an incandescent light bulb, one of the greatest inventions in the history of mankind. We live in a nation that requires that every gallon of gasoline include ethanol, an additive made from corn. So much corn is diverted to this that it has forced up the price of virtually every food product we purchase. At the same time it has reduced the mileage of every gallon. If you have had a lingering feeling that something is terribly wrong, you’re right. For now, the job at hand is to get the Murkowski resolution passed or, in effect, we might as well close the doors on America’s future because the EPA will destroy it. We are all witnesses to the crime; the deliberate murder of the United States of America. In just under a year and a half, the White House in collusion with the Democrats in Congress has conspired not to “save” America from a financial crisis they created, but to kill America through a series of multi-billion dollar “bailouts” that have two things in common. (1) They did not work and (2) they have created levels of national debt beyond anything in the entire previous history of the nation. Seen in this light, they are a brilliant game plan for destroying what was once the greatest economy in the world. It was based entirely on capitalist principles of free market competition, constant innovation, and entrepreneurial enterprise. Tied now as we are to the economies of other nations, there’s not much good news of late. The Obama administration has imposed the takeover of one sixth of the nation’s economy through its so-called health care “reform” and there are already revelations that it will not save money, but cost much more. It will deprive Americans of the right to make decisions with their physicians regarding all manner of treatment, some of which will literally determine life or death. It will reduce options for medical care as physicians, particularly in private practice, close their doors. Writing in the June issue of Health Care News, John C. Goodman said, “Despite assurances, the Medicaid expansion included in the health care legislation signed by President Barack Obama is not another unfunded mandate foisted on the states, many states will find their budgets bloated with new Medicaid spending.” Goodman is CEO of the National Center for Policy Analysis. It defied credibility that millions could be added to Medicare and Medicaid roles without raising the costs of these programs. In the end, Obamacare was forced upon Americans, the majority of whom opposed it and still do. Among the priorities of a new Congress, in the event that power passes to the Republican Party, is the repeal of Obamacare. The new financial “reforms” need to be rolled back as they too place limits on Wall Street that found itself victimized by the fact that Fannie Mae and Freddie Mac, two “government sponsored entities” are directly responsible for the housing bubble. It is insane that the federal government should hold the majority of mortgage loans. Yet the “reforms” just passed make no mention of either agency! The Cap-and-Trade Act, renamed a “climate” bill and awaiting a vote in the Senate, would raise the cost of all energy use in the nation and literally destroy the economy. Likewise, the effort of the EPA to regulate carbon dioxide would have the same effect. Another priority is to take General Motors off life-support for the unions that destroyed it through their salary, healthcare and pension demands. Here again, the federal government has no rational justification for such ownership. The most recent proposed bailout at a cost of $165 billion is yet another bailout for union pensions and this, too, is not a responsibility of American taxpayers. There was a time in the nation’s history when unions were needed, but now they are largely parasitic, draining the treasuries of the federal and state governments, and no where is this more obvious than in the Service Employees International Union. Obama is so closely allied with SEIU that one wonders why so little attention was paid during the 2008 campaign. This union alone is alleged to have spent as much as $60 million to secure his election. There are other government worker’s unions such as the teacher’s unions that exert political power in money, campaign manpower, and votes. The teacher’s unions have largely failed their mission to impart the most basic skills, leaving American students behind their counterparts in other nations. Their health and pension benefits, well in excess of the private sector, are a massive drain on the public treasuries of state governments. 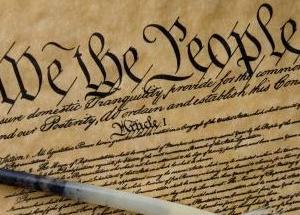 There are only two protections left to Americans, the courts and the ballot box. The courts appear to moving far too slowly on the issue of constitutionality regarding Obamacare and, in particular, Barack Obama’s eligibility to be President. All this demonstrates an astounding lack of power that has always being attributed to Wall Street and to corporations in general. 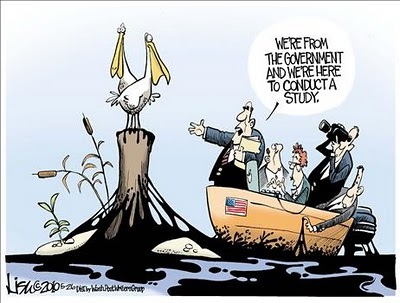 Environmental opponents popularly refer to them as Big Oil, Big Coal, or Big Pharma. They appear to have no power against an aggressively Marxist President, his administration, and a Congress dominated by progressives. On May 22nd, Rasmussen Reports revealed that 72% of likely voters say they are not confident that Congress knows what it’s doing as regards the economy. There has been little change in this opinion since September 2008. The voters, however, have demonstrated their power in the election of a Republican as Senator from Massachusetts and two Republican Governors in formerly Blue States. The primaries are demonstrating that the only way to win is to be anti-Obama and the best way to lose is to be an incumbent participating in the destruction of the nation. The current national state of mind is understandably one of growing fears and it should be in the face of the determined effort to destroy America. 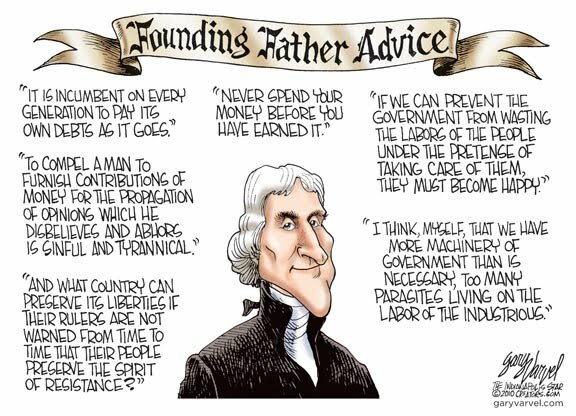 I am always impressed by how wise the nation's Founding Fathers were. John F. Kennedy once said at a ceremoney honoring Nobel Prize winners that their wisdom was only surpassed "When Thomas Jefferson dined alone." Recently the fourth annual survey of more than a hundred executives in the U.S. and Canadian electric and natural gas industries was released by Platts and Capgemini. Platts is a global provider of energy and metals information and Capgemini is a leading provider of consulting, technology and outsourcing services. The objective of the survey was to determine the opinion of energy industry executives regarding the first year and a half of the Obama administration’s energy policies. 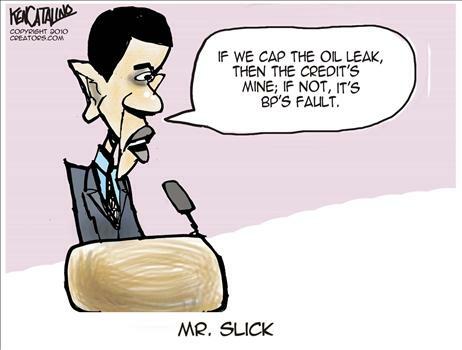 The Obama administration’s energy policy is to have as little as possible. The administration is bent on reducing access to national energy resources, coal, oil and natural gas, combined with a bizarre emphasis on “alternative” or “renewable” sources in the form of wind and solar energy. European nations that went this course ended up with fewer jobs, insufficient energy for the money invested, and massive fraud in its carbon credits exchanges. It is essential to understand that the nation’s utilities have all signed onto the bogus “global warming” theory that carbon dioxide emissions threaten all life on Earth because they can make gobs of money raising the rates they currently charge for electricity. They expect to do so via the bogus selling and trade of “carbon credits”, a key element of the Cap-and-Tax bill currently in the Senate. It is a massive robbery of all energy consumers and that means everyone. Under intense pressure from the government and from environmental organizations, many utilities have wasted millions on the installation of wind and solar farms, none of which provide enough electricity to even begin to meet their consumer’s needs. Moreover, they must all maintain traditional coal-burning, nuclear, and other forms of energy generation plants because neither wind or solar provide a reliable source of electricity. This is the big, dirty secret of the so-called “sustainable” energy from wind and solar. It is not sustainable if the wind is not blowing and the sun is obscured by clouds. Wind energy provides about one percent of all the electricity used daily in America. In 2006 solar power provided 0.1 percent! By contrast, nuclear provides about 20 percent and coal provides just over 50 percent! The alternative energy suppliers are sustained by a combination of taxpayer subsidies (your money) and mandates imposed on the utilities to include them with nuclear, coal and other energy sources. One way the government makes so-called sustainable energy appear to be a greater source is to include conventional hydroelectric energy. John Christens, vice president of Smart Energy Services for Capgemini, says, “Few utility executives consider the current solutions as satisfactory either in scale or feasibility.” That’s because there are NO current “solutions” to America’s growing needs for additional energy provision and the nation’s electrical grid is aging daily and in need of major upgrades. There is no “root issue” because carbon dioxide plays NO role whatever in climate change. The bloviations of Al Gore and the United Nations Intergovernmental Panel on Climate Change are a huge package of lies based on flawed and deliberately spurious computer model projections. In November 2009, the Climategate revelations that a handful of IPCC scientists had been misrepresenting the truth should have ended the global warming fraud, but it has only intensified the effort of those behind it to impose it on the world. At some point, having taken millions in government funding for research, particularly here in the U.S. and in England, some of these IPCC scientists should be on their way to jail if there is any justice to be had. The survey is barely useful to the public because it was taken among the very utility executives who are guilty of supporting the global warming fraud in anticipation of reaping obscene profits. The cost of energy will soar if the Cap-and-Tax bill waiting a vote in the Senate is passed and signed into law by the president. 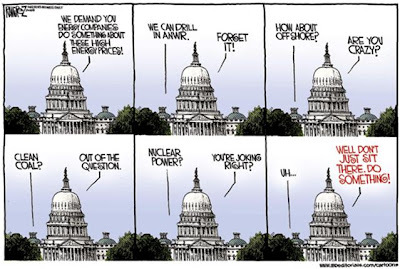 Meanwhile, the real energy policy of the Obama administration is to do everything in its immense power to thwart the building of any new coal-burning or nuclear plants while deceiving the public into believing that wind or solar has any real potential of meeting present and future needs. Dangling promises of “green jobs” is perhaps the cruelest lie of all. Virtually all of the technology required for wind or solar is manufactured overseas. The Obama energy policy can be summed up as no new energy, no new jobs, and a very dark future for America. And you thought the real problem was illegal aliens entering the US? I am putting together a list of email addresses of the editors of conservative websites and those folks who maintain "patriot" blogs. If you have a favorite blog or website that you visit regularly (like mine!) and can forward an editor's email, that would be most welcome. You can send the information to me at acaruba@aol.com or acaruba1321@gmail.com. 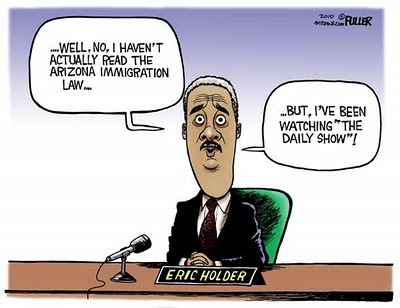 Is it too much to expect the Attorney General of the United States, the Secretary of Homeland Security, and the President to have actually read the law that the State of Arizona passed regarding illegal aliens? Is it too much to expect the President not to use that law—-the same as a federal law—-as a lame joke at the recent White House Correspondents dinner? 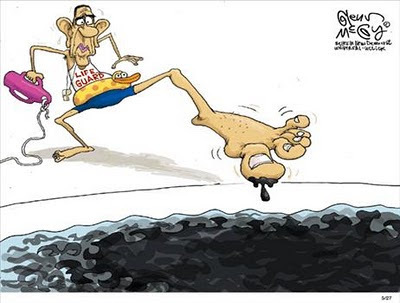 Does anyone really think President Obama has a clue about the actual facts concerning the BP oil rig accident? When all the reports are written, here’s what they will say. It was an accident. When words mask reality, reality has a nasty way of intruding. We’re told not “to jump to conclusions” about the Fort Hood shooter even though he was a deranged Muslim fanatic. The Christmas day attempted airline bombing? Everybody did their job says Janet Napolitano of Homeland Security. Well, no, everyone except the bomber. Time Squares bomber? AG Holder wants to hold a trial of the 9/11 planner a couple of blocks away. The whole Obama administration is shot through with people who got their tickets punched at various elite Ivy League and other universities, but who hold beliefs that are so mind-boggling that you wonder why the nice men in the white coats haven’t shown up to take them to a rubber room. The Secretary of Transportation dislikes cars and makes no secret of it. Meanwhile, the government owns General Motors and is still trying to find ways to make selling their cars more difficult by raising mileage standards. The Secretary of Energy thinks we should paint the roofs of our homes white to reflect back the light from the Sun in order to avoid the dreaded global warming. Apparently nobody has told him the Earth has been in a cooling cycle for the past decade. The President’s science advisor thinks it would be a good idea to put chemicals into the water supply to reduce fertility. Too many people eating, breathing, and—-Oh my God—-exhaling the dreaded carbon dioxide that will kill us all! NOT! The President pushed hard for his healthcare bill that was intended to reduce the costs of Medicare and, surprise, it will cost more if implemented. Around the nation, doctors are dropping out of the Medicare program. Try buying health insurance from any company other than the government in a few years. How stupid and Marxist is it to take competition out of this process? As for the President himself, he is just an endless source of gaffs and pratfalls. Recall those early months when he couldn’t say a word without a TelePrompter? Remember Steve Croft of “Sixty Minutes” taking him to task for laughing inappropriately? “Are you punch drunk?” asked Croft. Or Fox News’ Bret Baier trying to get him to give a straight answer to ANYTHING? We are now nearly a year and a half into Obama’s first and only term in office. He is still trying to blame former President George W. Bush for EVERYTHING. I half expected to hear him say that George W was seen fishing nearby the BP oil rig shortly before it blew up. 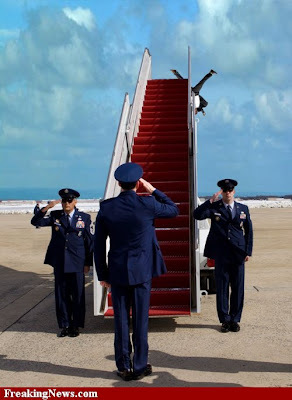 It took Obama nine days to even fly over and look at the busted rig. Katrina, anyone? Just call him President Kiss-of-Death. So far, every Democrat candidate that Obama has endorsed for election has lost. I hope he keeps it up. 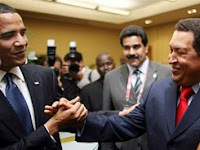 Meanwhile, I pray that we last until November when we can throw the whole useless, crazy bunch of Democrats out of office and then slow down Obama’s mad race to “transform” America into something more closely resembling Fidel Castro’s Cuba or Hugo Chavez’s Venezuela. His ultimate goal is to totally undermine the American system of governance along with the financial structure that maintains it. That is theis administration's greatest threat to the nation and is being relentless pursued. I have been a book reviewer since the 1960s and am, in fact, a founding member of the National Book Critics Circle, but I rarely devote a commentary to a particular book. I am, however, going to recommend you read “The Manchurian President: Barack Obama’s Ties to Communists, Socialists and Other Anti-American Extremists” by Aaron Klein with Branda J. Elliot. All your worst fears will be confirmed. Using Saul Alinsky’s “Rules for Radicals” as their guide, “progressives” (otherwise known as communists) have, since the 1970s, been boring from within, hiding their anti-American beliefs and allegiances to infiltrate the nation’s universities, its media, and to gain power in its various levels of government. They have now hit the jackpot with the election of Barack Obama as President. The Congressional Progressive Caucus is the largest of the Democrat Party caucuses in the House of Representatives with 83 declared members. Among its more prominent members is Speaker Nancy Pelosi, Barney Frank, Charlie Rangel, and a co-authors of the Cap-and-Tax bill presently in the Senate, Ed Markey and Henry Waxman. 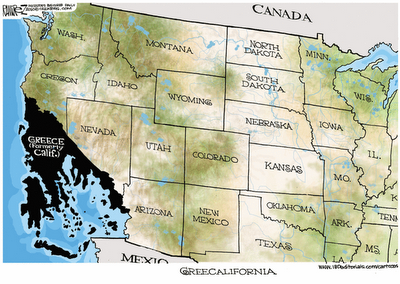 There are 15 members from California, eight from New York, and six from Illinois, but most states are represented. Suffice it to say they wield a lot of power. Of the twenty standing committees in the House, ten are chaired by members of the CPC. This explains why the Healthcare bill got rammed through and why we are in danger of seeing the same process at work with Cap-and-Tax and an amnesty bill. Klein’s book is intensively researched and footnoted with 54 pages of citations. On May 15th, “The Manchurian President”, made it to the famed New York Times list of bestselling books. If you had any doubts that President Obama is a Marxist, you can put them aside. He was what has come to be called “a red diaper baby”, raised, mentored, and steeped in the socialist ideology that calls for a “redistribution of wealth.” Needless to say, he did not make much mention of this during the 2008 campaign, but then neither did Hillary Clinton who, along with her husband, subscribes to a similar political agenda. One of the reasons you never hear about this takeover of Congress and other institutions of the nation is that the media is very much a part of it and thus part of the cover-up. Indeed, the media did everything in its power to get Obama elected even though he had not even served one complete term in the Senate from Illinois. Klein’s book is page-after-page of revelations that connect the dots as it examines Alinky’s “community organizers” program by which radicals can impose their will on Americans and change the nation from a constitutionally-based republic to one in which the government owns or controls everything. Klein names names among Obama’s closest advisors, some of whom form his cadre of appropriately named “czars.” It identifies the many socialist groups pushing his agenda and, in particular, those drafting the legislation that has occasioned the rise of the Tea Parties to protest it and to organize to support candidates like Rand Paul who ran on a platform of “taking back America” from these political termites. Americans who have essentially been sleep-walking through their recent history as socialist legislation from Social Security to Medicare and dozens of other governmental control over key sectors of the economy were unconstitutionally foisted on them in the form of agencies such as the Environmental Protection Agency and the Departments of Education and Energy. There is no authority in the Constitution for them. From the unions to ACORN, the process has aggressively moved ahead in the first year and a half of the Obama administration. An aroused and frightened America has been making its voice heard in the elections of conservative governors in Virginia and New Jersey, an anti-Obamacare Senator from Massachusetts, and now in the primary elections to determine candidates. It is not too late. November will determine the fate of the nation if power can be wrested back from the Democrat controlled Congress and, in two years, Obama be defeated for a second term. After that, an enormous job of reversing the slow death of America can begin. The recent performance—-that’s the only thing you can call it—-of Attorney General Eric Holder before a Senate committee set me thinking. How was it that the AG could not or would not connect the dots between the Fort Hood murders, the Christmas Day bomber, and the failed Times Square bomber? With stunning obtuseness, he professed he could not find any Islamic connection despite, of course, all three being Muslims and all three having communicated with or trained with Islamic terrorist groups. 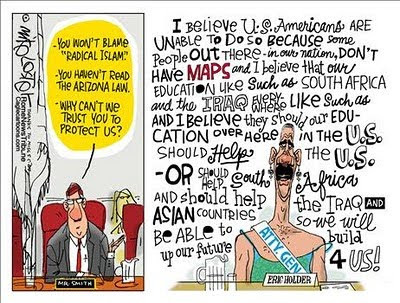 When, out of desperation, Arizona passed a law saying that illegal aliens should be subject to be asked if they are illegal, the President thought that was downright unconstitutional even though the Arizona law mimics the federal law that seeks the same determination. Even so, cops would only be able to ask if they believe a crime was being committed or about to be. 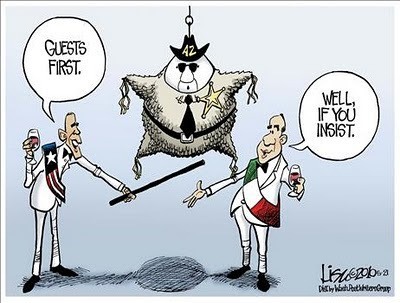 It’s not that different from the frisk law that allows them to pat down suspected law-breakers. It is much worse when you consider that the Senate is going to be asked to vote on a so-called “climate bill” that is based on the totally debunked science that says carbon dioxide has anything to do with climate change. It doesn’t. It’s barely 380 parts-per-million in the Earth’s atmosphere and most of the rest is just plain, old water vapor. The Senate, however, knows it’s not a climate bill, but rather a stupendous way to raise gobs more money for the government to spend and waste. It would tax energy use, raise the cost of gasoline, and further impoverish Americans. It is pure fiction and pure robbery. It will kill the U.S. economy and with it the nation. It’s the same kind of fiction that was passed off as healthcare reform. The Speaker of the House, Nancy Pelosi, thinks Americans are so stupid, she actually said, “We have to pass it so we can find out what’s in it.” That’s what we want; legislators that no longer actually read the laws they’re passing. And, of course, weeks after passage, the CBO took a look at the bill and concluded it will increase the cost of medical care by billions. Every time some White House advisor or Cabinet Secretary opens their mouth, it just adds to the flummery because they are either clueless, lying, or both. They are, however, mostly just lying. So, Americans are supposed to believe now that it is perfectly alright for Iran to develop the capability to make nuclear weapons. 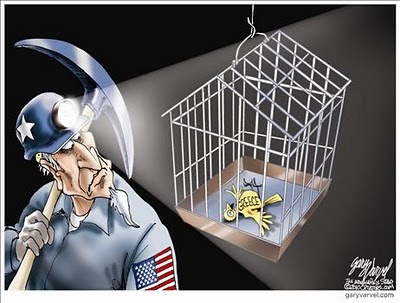 Iran is a nation that sits atop billions of barrels of oil but has never built a refinery, perhaps because it is too busy refining uranium to a weapons grade level. We are supposed now to believe that Israel, an ally of the U.S. since its founding, is not seeking a peaceful solution with the Palestinians after having already pulled out of Gaza and turned it over to them while also granting a measure of authority over a section of the West Bank. Never mind the endless attacks on Israel and its citizens, a daily affair. The pioneer in space exploration, the United States will now abandon these and comparable efforts. To get to the space station, we will have to hitch a ride with the Russians or Chinese. This too is absurd, but it is also Obama’s new policy. As for those annoying wars in Afghanistan and Iraq, Obama has announced the date we shall leave. This is a great comfort to our enemies there. Why fight our enemies in their backyard when we can just wait for them to show up here? 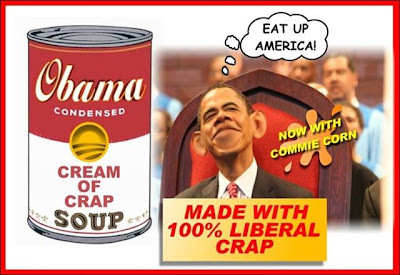 Turning General Motors over to the unions that literally destroyed their golden goose and doing as little as possible to defend our southern border are just more absurdities, but we might as well get used to them because they is the main dish on the Obama menu. Obama’s America has been turned into a giant funhouse full of mirrors and a rollercoaster ride to hell. “Denial” is not a river in Africa, nor is it a proper term for the legion of climatologists, meteorologists, geologists, and others like myself who have devoted decades to debunking the utter rubbish called “global warming.” So toxic has the term become, the charlatans pushing the fraud have long since abandoned it and begun to refer to “climate change” instead. The Earth is 4.5 billion years old and I daresay that its climate has been changing since it first cooled, oceans formed, and one-celled forms of life began to develop into complex creatures like dinosaurs, Al Gore and politicians continuing to lie about global warming. The Fourth International Conference on Climate Change concluded Tuesday in Chicago. Sponsored by The Heartland Institute, a non-profit, free market think tank, it brought together eminent (and legitimate!) scientists and other distinguished folk for panels and speeches addressing the arcane mysteries of climate. Among the dignitaries addressing the thousand or more people who attended was former astronaut, Harrison Schmitt, PhD, a one-term Senator who discussed why the U.S. Constitution makes no provision whatever for the Department of Energy or the Environmental Protection Agency. For three days men who know their science in ways that would fill entire libraries held forth. A Google search for any mainstream media coverage of the event turned up little evidence of it, nor is it likely that were I to list the names of the speakers, you would have ever heard of them. These foremost “deniers” have received short shrift in a media that has been determined to convince Americans that the Earth is burning up due to an infinitesimal amount of carbon dioxide in the atmosphere. The conference was of great significance this year because the Kerry-Lieberman Cap-and-Tax bill has been introduced in the Senate for the purpose of putting limits on carbon dioxide emissions, i.e., the use of all energy; a bill without a scintilla of scientific justification, nor merit. It will, however, create the buying and selling of utterly bogus “carbon credits” to enrich utilities and those involved in the exchanges based on the global warming fraud. It will also kill the U.S. economy. I attended the first three conferences and, although I have been a member of the National Association of Science Writers since shortly after the last ice age ended, I confess that when some of the scientists began to get deep into the issues of climate anomalies, minutia of paleoclimatology and comparable matters, my eyes would glaze over and I would feel a strong urge to take a nap. It occurs to me that this has long been a part of the problem for most people who either dropped out of school, slept through science class, or who preferred to ignore all the silliness of global warming being blamed for…for…for everything. The problem is that global warming or climate change is being used to manipulate the world’s population into accepting global governance that involves the loss of their nation’s sovereignty in favor of international organizations like the United Nations. A draft international treaty making the rounds would be the end of democracy. Not surprisingly, the whole global warming scam began somewhere in the bowels of the UN, emerged with the Kyoto Climate Change Protocols, and is the basis for the waste of billions on “clean” or “alternative” energy in the form of wind and solar energy. It is a full scale attack of the very basis for modern life, the use of coal, oil, and natural gas. Those of us living in advanced societies tend to forget that vast portions of the globe have no electricity whatever. How would you like to cook your dinner over dried animal dung? The conference and the fact that the mainstream media has once again chosen to ignore it is a shining example of why the MSM is losing readers and viewers who have correctly concluded it can no longer be trusted. 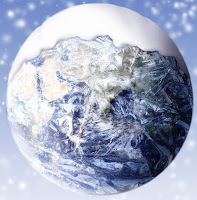 The biggest news emerging from the conference is that, in addition to the fact that the Earth is ten years into another perfectly natural cooling cycle, it is also verging on another ice age. We are all literally at the end of an interglacial period of approximately 11,500 years. Every couple of decades, the world needs to sort out its various grievances. The most common mode of doing this is war and it is a truism of war that those waging it, successfully or not, sooner or later want it over. Empires, great and small, are always exhausted and generally ended by wars, even if they are on the winning side. The last century was distinguished by two World Wars. The first was largely limited to Europe. Mechanization increased the numbers killed and it ended so poorly for Germany that it felt compelled to go to war again a mere twenty years later. That ended poorly for them as well. Making matters worse, the Japanese had dreams of empire at the same time, thus making both conflicts truly global. Their dreams ended under a mushroom cloud on August 6, 1945. This did not dissuade the North Koreans from invading South Korea a few years later. 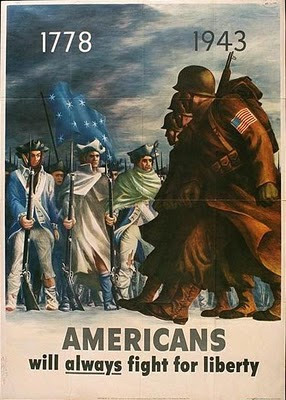 The United States led a so-called United Nations coalition of forces, but as usual we did the most fighting. We went that route again in Vietnam until Americans began to fill the streets of Washington, D.C. with protests and, eventually, we left. Things quieted down for Americans after that. We had a sortie or two in Panama and Grenada, and suffered losses as part of a peacekeeping force in Beirut. The Russians decided to invade Afghanistan and that turned out as badly for them as Vietnam for us. After 9/11 we were the next ones into Afghanistan and have still been unable to leave. After Iraqi dictator, Saddam Hussein, had finished unsuccessfully waging war with Iran and then invaded Kuwait, it was a fairly easy decision to put troops in Iraq to get rid of him. We are still there. At the end of World War One, the League of Nations was created to avoid future wars and then ignored. After World War Two, the United Nations, a pet project of Franklin D. Roosevelt, was created. Its first, interim Secretary General was a Soviet spy who worked at the highest levels of the U.S. State Department. Not a good start. The United Nations is now the solely owned property of a coalition of Middle Eastern, African, and various socialist nations in South America and elsewhere. It is not merely useless, it is evil incarnate. Everyone in its headquarters on the East River should be told to find someplace else in which to intrigue against the U.S. After that, the headquarters should be fumigated and turned into condos. After the world wars there was a passion to create international organizations whose purpose was to resolve conflicts, create trade agreements, and, in the case of the International Monetary Fund, bail out nations too stupid or criminal to conduct their own affairs without adult supervision. Along with the World Trade Organization and similar organizations, ostensibly, the object was to maintain global stability, but the reality has been the establishment of global governance; one in which the central banks play an important role. To achieve this, nations must be induced to relinquish their national sovereignty. In Europe, to avoid any more wars between Germany and France (which dragged everyone else into the mess) the European Union was formed. It sports a common currency and open borders. It came complete with a huge bureaucracy to promulgate thousands of regulations and a whole new class of useless political jobs. None of this international fervor seems to turn out well and the EU is watching its plans for a united Europe go up in smoke thanks to Greece and other members tottering on bankruptcy. So much for the theory that global or multinational organizations are any better at running their own affairs than individual states, particularly if they are socialist economies. If you think about it, getting all of the now fifty American States to work together as we have since the Constitution was ratified in 1788 is nothing short of a miracle, although we did take time out in 1861-1865 to sort out the nasty business of slavery. As usual, war was the way the matter was settled. We have now arrived at 2010 and, as we look around, the U.S. has its military in Afghanistan and Iraq, along with an estimated 700 to 800 bases and missions, large and small, around the world. It has personnel in some 156 nations and always by invitation unless, as is the case with Afghanistan and Iraq, we’re there due to provocation and national security. The entire world’s security is threatened by the rise of militant Islam and that genie has to somehow get put back in the bottle. Killing the Islamists from among 1.3 billion Muslims seems to be the only way to do it. The contagion of financial failure is likely to lead to worse problems and, unfortunately, the United States will not be exempt because it too is deeply in debt. 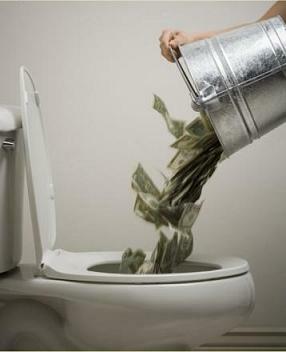 The national debt under the present administration has been tripled. Collapse is a very real possibility. Nations in the Middle East and anywhere they are run by despots will see an opportunity to resort to military means to expand their power. In the same way the world fell to making war in the 1930s, it is on the brink of a similar scenario unless the prospect so frightens the leaders of Western and Asian nations that they will be left with little else than to threaten all others to settle for solutions that do not involve missiles, armies, navies and air forces. The much vaunted “globalization” has masked the reality that individual nations must act responsibly or pay the price. 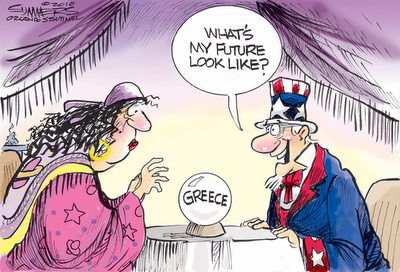 History does not forecast a good outcome. Venezuela is being transformed into a Nazi state and the first sure signs of it are the attacks on that nation's Jews. Why can't we find any news of this in the U.S. mainstream press? Why is this not addressed at the highest level of our government? Many years ago I sat in the office of the managing editor of The Star-Ledger, then and now New Jersey’s largest circulation daily newspaper. I had been working at the Morris County Daily Record. By way of proving my worth, the editor asked me to do a series on pets. I wrote a four-part series that exposed a fair amount of chicanery involving the New Jersey Humane Society and the American Society for the Protection Against Cruelty to Animals. “You don’t understand,” said the editor. “I wanted something along the lines of Jane and her pet duck.” I didn’t get hired and shortly thereafter I became a public relations flack. My years as a journalist on weekly and daily newspapers taught me a lot about the way being a reporter inevitably creates a sense of hubris regarding what the reader should be told. There’s a real feeling of power in writing an article or, better still, a column that says, in effect, this is the truth. This is particularly true of journalists who cover the state house or, at the highest level, the White House. Either way, reporters who also write columns soon conclude they know how to run the state or the nation better than the person elected to do the job. They like being close to power without being responsible for the tough decisions. The former Governor, Jon Corzine, a multi-millionaire and former Goldman Sachs executive bought a seat in the U.S. Senate by outspending his opponent, grew bored there, and then repeated the process to become Governor of New Jersey. He was so allied with the civil service unions and so liberal that the Garden State, along with California, became the poster child for poverty. The Star-Ledger was his cheerleader much of the time. To the horror of the newspaper and astonishment of the nation, the deeply blue State elected a Republican, Chris Christie. And not just a Republican, but a genuine conservative who looked at the State’s economic mess and determined to reverse it. Christie had amassed an impressive record as a U.S. Attorney for New Jersey, putting a large number of its corrupt politicians in jail. At a recent Trenton press conference, a political reporter for the Star Ledger, Tom Moran, asked Gov. Christie if he was being too “confrontational” with the Democrat majority in the legislature and the Governor let him have it. The YouTube video went viral to the point that Fox News commentator, Sean Hannity, shared it with his audience. It was a gem; a real politician explaining that he had been elected precisely to put an end to the way the wealthy, corporations and lots of regular folks were fleeing New Jersey, a State with the nation’s highest property taxes, sales taxes, and every other tax imaginable. At one point the Star Ledger restricted YouTube from showing the video even though it was still available on its own website. In the Sunday, May 16 edition, Moran fired back with a column titled, “Gov. Chris Christie’s ‘confrontational tone’ may cause him to lose needed partners among N.J. Democrats.” Christie would not be Governor if a lot of Democrats had not voted for him. Like daily newspapers all over the nation, the Star Ledger is losing circulation, in part due to the availability of real facts and informed commentary available on the Internet. The other part of that equation is that people began to realize just how biased their local daily was. The die-off of newspapers is gaining momentum, along with formerly respected weekly news magazines like Newsweek, Time, and U.S. News and World Report, all of whom are appallingly liberal in content and which continue to tell lies about “global warming”, et cetera. Newsweek is up for sale. Moran has a right to his opinions, but they clearly inform his reporting as well. He should do one or the other, but not both. Ironically, Moran left the Star-Ledger for a job on the public relations side of the desk, but soon returned to his job as a political reporter. No doubt he will be churning out both “news” stories and columns for Christie’s term in office and, no doubt, more readers will decide to drop their subscription. This is what happened when President Obama was told that Air Force One had been equipped with an invisibility shield. NJ Gov Christie Replies to a Reporter -- Priceless! Herein Gov. Chris Christie shreds a reporter from the Star-Ledger, the largest daily and one that is dependably liberal. Editor's Note: This video was restricted on Saturday by the Star-Ledger, but found its way back onto YouTube. There is something noxious about a newspaper censoring a video of the Governor responding to a question by its own reporter. The video, however, remains available as of early Saturday on the Star-Ledger's own website. Go figure? It’s not just the lies about climate change. It’s not just the lies about renewable, wind and solar, energy. It’s not just the lies about so-called endangered species. It’s not just that the Obama administration refuses to name Islam as the source of the terrorist attacks on America. It’s not just the government takeover of auto manufacturers or insurance companies. It’s not just a Federal Reserve that is not subject to audit, nor its purchase from banks (at 100 cents on the dollar) of billions in “toxic assets”, nor the fact that it is free to flood the economy with currency with shockingly little congressional oversight. It’s not just that a new oil refinery has not been built since the 1970s, nor that new nuclear plants are not being built here while elsewhere around the world they are being constructed with growing rapidity. It’s not just that federally sponsored entities like Freddie Mac and Fannie Mae own the vast bulk of all the mortgages in America or that they are primarily responsible for the financial crisis the nation suffered. It’s not just that banks and mortgage firms were required to make loans to people who clearly could not repay them. It’s not just that the latest nominee to the Supreme Court has been selected exclusively on the basis of her socialist viewpoint or lacks a record of judicial experience. It’s not just that the nation’s educational system is entirely controlled by teacher’s unions, the result of which produces students who cannot compete academically with those in other nations or that the federal government insists on a failed one-size-fits-all testing formula. It’s not just that the federal government, responsible for the protection of our borders, has totally failed to do so while our southern border has become a virtual war zone. It’s not just the U.S. cannot afford to help “bail out” Greece with billions of taxpayer’s money while our national debt soars to historical new heights. It is not just that Democrats, the majority party, are using their political power to impose laws opposed by the vast majority of Americans, endangering future generations with massive debt while nationalizing one-sixth of the nation’s economy. And it is not just that the credentials and standing of the President of the United States are subject to legitimate inquiry and challenge that is being stalled in the nation’s courts. It is a combination of these and other factors that are based on a contagion of lies told to Americans by their own government.